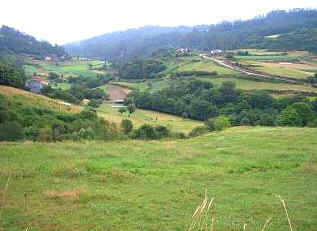 Lousame is not so much a town as sprawling district made up of many small villages and farms. 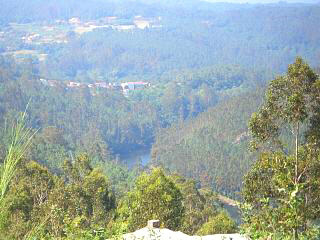 Lousame is spread across the "Barbanza" mountain range and combines forests of pine and eucalyptus with lush meadow and farming land. The district of Lousame has no physical contact with the sea and has no ports or obvious fishing connections. Lousame has an old monastery, "San Xusto de Toxosouto", which dates all the way back to the 12th century and was consecrated by the Arch Bishop of Compostella and is definitely worth a visit if you like your old buildings. It also has the ruins of an old paper factory, but that hardily constitutes an ancient monument in my book! What Lousame really offers is spectacular countryside, mountain vistas and the smell of clean fresh air scented with pine and eucalyptus. We always take a drive through Lousame and never fail to be impressed with its scenery. The roads are narrow, but two cars can cross comfortably and the condition of all the routes you take will be good. If a particular road looks overly narrow, avoid it and take another, but other than that the best way to enjoy Lousame is simply to follow your nose. If you want an idea of what this area looks like, I have included a couple of photos, but they simply fail to do justice to the awe inspiring views that you will encounter. I personally like Lousame for many reasons, but one is because my wife's uncle has a farm in this region and whenever we visit they feed us with home grown chicken and pork, following which we sit outside under a canopy of grape vines and watch the world go by. They also have the most spectacular view from the rear windows of their house looking down in to a valley with mountains in the distance and to either side. It sounds great, but my wife's uncle starts work early and after taking the traditional siesta in the afternoon, returns to work, often not getting home until 9pm or 10pm at night. Farming in this part of the world is still a very manual activity and although tractors and farm machinery are used on the larger farms, the small holdings still do a lot of the work by hand, be it planting or crop collecting. 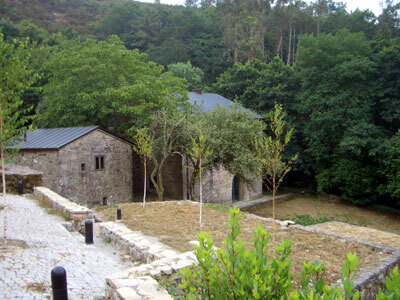 Right, this is the monastery (now a pilgrim's hostel) in Lousame. If you go to our next Lousame page you will find out more about it (the button is in the menu in the right hand column). If you do explore Lousame, or similar country boroughs, you will most likely see oxen pulling ploughs and other wheeled farm vehicles along with ladies carrying large, vegetable filled , baskets on their heads. Much of what goes on here does move at a slower pace than that of the bigger towns, but life is hard and the work is physical. Have you been convinced to visit Lousame? Well if you hate the rural life and don't like greenery, it won't be for you. But that said, neither will the rest of Galicia.